The average salesperson spends 4 hours per week updating his or her Salesforce CRM. However, this is hardly enough—the average salesperson only manages to complete 40% of sales updates. Automatic data entry will revolutionize that. Diligent sales managers explain to their team, “If it’s not in Salesforce, it never happened.” In a world where sales managers need to be on top of their numbers, reps find themselves spending more and more time doing tedious updates to their CRM instead of spending time engaging and converting new customers. However, new automatic data entry technologies can help—reps can spend more time selling, while management can enjoy having the complete and updated numbers, always and almost in real time. To analyze how much time people spend updating Salesforce, and the number of updates that they need to make, we analyzed data anonymously from hundreds of companies and thousands of sales reps that used Implisit (acquired by Salesforce). Implisit analyzed the sales reps’ emails and whether they were updated into the CRM. Then we analyzed the number of sales updates that were never updated in the CRM. Here are the results. Nearly half of the Salesforce updates are Tasks, which take around two hours per rep per month to update in Salesforce. 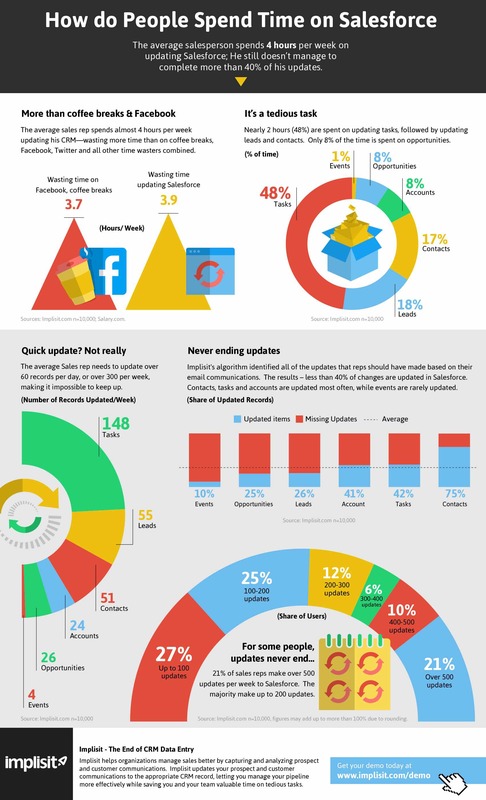 Leads take about 18% of rep’s weekly updates and Contacts around 17%. These Tasks can be easily updated automatically. The number of updates that reps have to make is staggering. The average sales rep needs to update over 60 records per day, or over 300 updates per week in order to keep their Salesforce CRM fully up to date. Obviously, as reps also need to spend time selling, it makes it hard for them to keep up. The number of updates that a rep has to make in order to keep the CRM up-to-date makes it hard for reps to keep up. Implisit’s algorithm identified all of the updates that reps should have made based on their email communications. The result—less than 40% of changes are updated in Salesforce. Contacts, Tasks, and Accounts are updated most often while events are rarely updated. Reps with a lot of sales activity need to spend a lot of time updating Salesforce. 21% of sales reps make over 500 updates per week to Salesforce. The majority make up to 200 updates. Learn more insights in the infographic from Implisit below. Sales reps should spend time selling. Spending four precious hours on Salesforce updates should not be a part of the job. Technology can eliminate the challenge of data entry. By mining the reps email account and connecting the reps’ email to Salesforce, smart algorithms can identify when events and meetings happen and update the right Lead, Contact, Account, and Opportunity. Automatic updates will both allow reps to spend more time engaging clients and will give management more accurate and complete data on their sales performance. Data management tools, like RingLead Data Management Solutions (DMS), can help dramtically decrease the amount of time sales rep spend updating Salesforce. DMS Capture not only accelerates time spent updating, it also helps with time spent prospecting. Capture can collect 1000+ leads from Linkedin profiles, websites and email signatures, and easily export them into your CRM (without creating duplicates), with the click of a button. Additionally, sales reps can enrich all of the empty fields they weren’t able to gather, such as direct dials, mobile numbers and email addresses, in minutes. Capture saves hundreds of hours on manual data entry for sales reps, leaving more time for what they’re paid to do – sell! Want to see how RingLead DMS can save your sales reps time almost instantly? Click the box below to schedule a demo today!